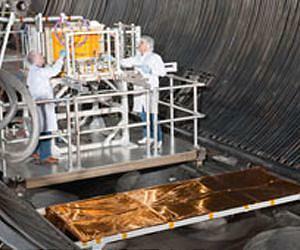 The SCaN platform being prepared for testing at NASA’s Glenn Research Center (Credits: NASA). The Space Communications and Navigation, or SCaN, testbed will launch to ISS aboard a JAXA H-IIB transfer vehicle in 2012. Designed by NASA, SCaN will be an orbital laboratory attached to the exterior of ISS containing three Software Defined Radios (SDR). SDR is the key to the promise of this technology. “A Software Defined Radio is purposely reconfigured during its lifetime, which makes it unique,” says Diane Cifani Malarik, project manager for the SCaN Testbed. This type of technology has potential to hugely advance communication and navigation systems on deep space missions. Due to the long development time for such missions, by the time spacecraft are launched much of their equipment is already outdated. Using SDR technology, upgrades could be made to allow the spacecraft to interface with newer and older equipment designs, providing a significant increase in mission flexibility. Such capabilities could be a significant advantage for future deep space manned flights as well. The SCaN testbed has an anticipated lifetime of five years. It will be robotically mounted on the ExPRESS Logistics Carrier-3 on the exterior truss of ISS.